Amanda and I haven’t really celebrated the day since we were dating. It’s not that we aren’t the romantic types, it’s just that you could spend any given day with us to see that we don’t need a specific calendar date to celebrate what we have. We work out together, play together and every ‘cheat day’ is a good day for chocolate. We have little moments every day that are romantic … and goofy, playful, dorky, fun, loving and weird. We also have a picture to go with a great many of them. The pictures themselves aren’t always the highest quality – blown highlights, distracting backgrounds, some are out of focus. They’re shot with our cell phones and our little point and shoot we use for travel. I spend a part of every day critiquing photographs, mostly my own, but also for students and peers who request a different pair of eyes. What I have to remind myself is that these aren’t client images nor earmarked for competition. These are the moments and memories that make up our life together. In that regard, they’re the most important images we have. They’re backed up, of course. Just as my clients’ images are stored in backup drives and on the ‘cloud’, our snaps are given the same measure of security. Simply because they’re not set up and lit the way my ‘professional’ work is doesn’t make them any less important. They’re actually more important. They’re us, the every day us that means everything. For all the little mistakes and missteps we all make in life and love, it’s the little moments that matter at the end of the day. The treasures meant to be treasured. So, we came to the realisation that our snapshots, regardless of the fact that they were “just” (ugh … that word. The great disparager …) taken spontaneously with a cell phone or cheap camera, should be printed. I certainly don’t advocate taking a well-crafted photograph and locking it away in a digital safe like just another file, so why would we do so with our genuine memories? We wouldn’t or, at least, we shouldn’t. This Valentine’s Day, we committed to “we won’t”. It doesn’t matter if your photos are professionally made or snapped on your phone this morning – back them up and print them. Love them. Treasure them, unconditionally. It’s worth the time and the money to do so. After all, you took those pictures for a reason, whether or not you remember that reason right now. Don’t lose them for no reason (and, yes, laziness is “no reason”). And enjoy watching this video with photographer Kevin Gilbert. It makes all the sense in the world. This entry was posted in General, Photography and tagged Family, Ideas, Memories, Opinion, Together, Valentine's Day, cell phone, couples, families, love, photos, pictures, print, prints, save, snap shots, thoughts. Fully agree Jay, both on printing and backing up your images and in not needing a special day to show how you feel to the people that matter to you. I’m in total agreement. 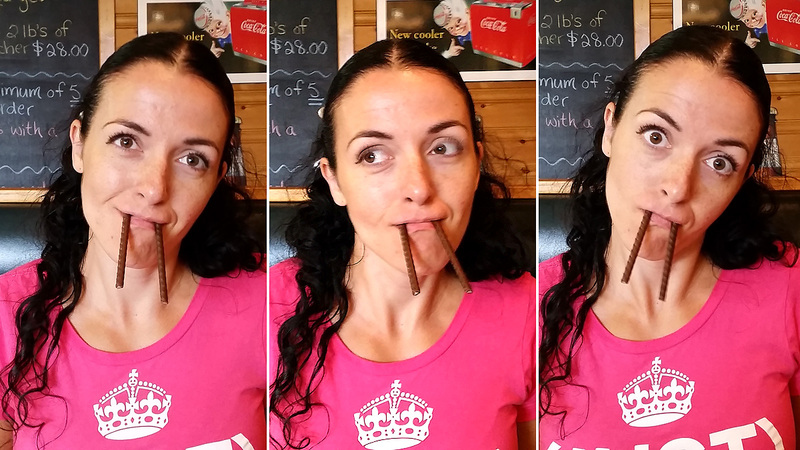 Amanda makes a cute walrus, but the image of you after your coronation is an amazing capture. Jay can smile. Now off with that butterflies head!